The Catalina Macaw is a very colorful parrot. It is a cross between a Blue & Gold Macaw and a Scarlet Macaw. The Catalina Macaw has two very popular types of macaws as its parents. The Scarlet Macaw, one of the most highly favored, is described as "beautiful and striking". The Scarlet has been the best known South American parrot for over 100 years. The other parent, the Blue and Gold Macaw, has been has been one of the most popular pet birds in the trade, renowned not only for its beauty but for its gentle, amiable nature. 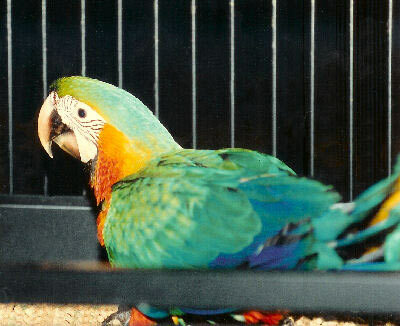 Hybrid macaws are bred for color. The Catalina Macaws are a first generation hybrid macaw, though today there are second generation Catalina Macaws whose parents are both Catalinas. Because they are a mixture of more than one type of macaw, the offspring are influenced by the traits and characteristics of both of its parents. Father's have the dominant gene, so this will generally influence the offspring's coloration and overall appearance. The Catalina inherits its gorgeous coloring from these two striking parents. The behavior and temperament of hybrid macaws are more unpredictable and uncertain than the coloration. The personality of a Scarlet is such that it requires good socialization and a firm consistent hand in training, especially as it matures. The Catalina can have these characteristics, but it can also have the gentle nature and the speaking ability of the Blue and Gold Macaw mixed in. It can be a very affectionate, inquisitive, and fun pet that is beautiful. Scientific name: The Catalina Macaw is a first generation hybrid macaw.. It is a cross between a Blue and Gold Macaw Ara ararauna and a Scarlet Macaw Ara macao. Description: Catalina Macaws are among the most colorful of the Macaws. They are a full size Macaw and can learn to talk with a general vocabulary of about 15 or more words or expressions. Because the availabilities of female Blue and Gold Macaws rather than female Scarlet Macaws, the mother is often a Blue and Gold with the father being the Scarlet. With the father's dominant gene, the Catalina usually has yellowish to orangish red on the chest and some on the back. The top of the head and wings has some green moving down into blue greens. They are similar in appearance to Harlequin Macaws, but with the long tapering tail of the Scarlet. Care and feeding: A roomy cage is required unless the bird is to be let out for extended periods. Many birds can spend most of their time on a play pen or parrot perch. They eat a variety of seeds, nuts, fruits, commercial pellets, as well as the same nutritional foods humans eat. See About Macaws: Housing and About Macaws: Care and Feeding for more information. Breeding/Reproduction: This is a hybrid and it use to be that hybrid macaws were generally not bred, however the breeding of hybrids is becoming more common. See About Macaws: Macaw Breeding, Bird Reproduction - Baby Macaws for information on breeding macaws. No visible differences in the sexes.. Potential Problems: Can be noisy (as can all macaws). See About Macaws: Potential Problems for information on illnesses. Availability: The Catalina Macaw is a popular hybrid that has been successfully bred for many years. It is most commonly a first generation hybrid, but second generation Catalina hybrid macaws are also seen today, whose parents are a cross of two Catalinas. Finding these beautiful macaws for sale is easier than some of the less commonly bred hybrids..
Do you want to sell your macaw? Location? Price? Can you give me more info on your baby? You may contact me at 850 866-3229 with more info on your catalina, It must be a female but very interested. I have a Catalina Macaw that I am looking to move very cheaply. You can call me at2404624653. Macaws are very loud, very loud!!! They make poor pets. When you buy one, nobody will buy it when you want to sell it!!! Believe me. I’m stuck wit one. My Catalina macaw Moon is not only very affectionate with me, but unlike what I have been reading Moon the macaw has like a 150 word vocabulary. I never fed him treats to get him to talk. And he uses phrases when appropriate and when he wants something. He also sings along with my yellow nape Amazon when we sing. He does't sound real nice but he sure tries.